Hello, lovelies! And Happy Chinese New Year! 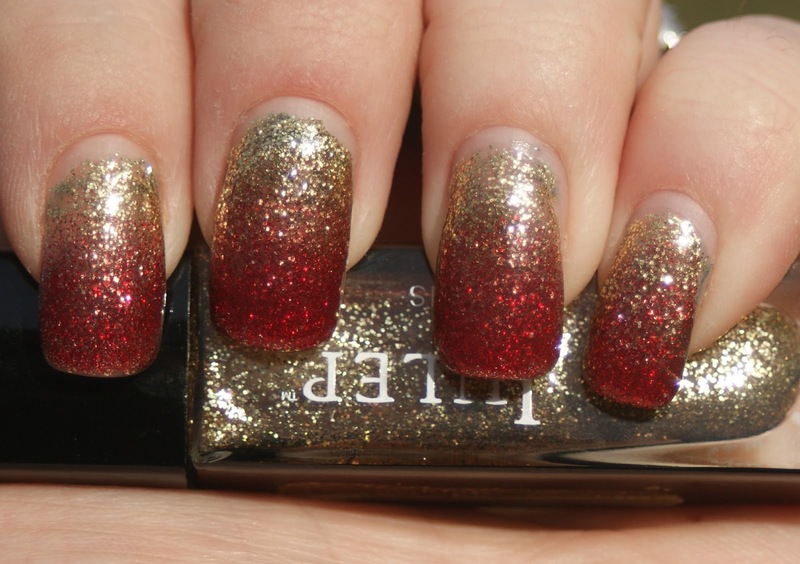 Today, I'm going to show you my most recent glitter gradient featuring, what else? Red and gold! In order to achieve this look, you need a cosmetic wedge and two chunky glitter polishes. I chose Julep Oscar and China Glaze Ring in the Red, the latter of which I bought my junior year at Rutgers and hadn't used up until this manicure. Fair warning, my nails are going to look SO much longer here than the last few posts because I rocked this gradient long before I chopped my nails down! I like them so much better now! I used three coats of Oscar as a base and sponged Ring in the Red from the tip of the nail down. I really like how this turned out. I think that using chunkier glitter makes for a better fade. The pieces of glitter start to get wedged between each other creating a speckle effect that lends itself really well to a gradient. The main tip I have is to do VERY light coats when you sponge with the glitter for a good speckle fade. Leaving too much on the sponge makes for a big blob... and nobody wants that! What do you think of my Chinese New Year gradient? Will you be rocking red and gold today?